Dubai is paving the way for a new and innovative world with the introduction of a virtual aquarium designed to scan a passenger’s face or iris using hidden cameras while they are in motion. 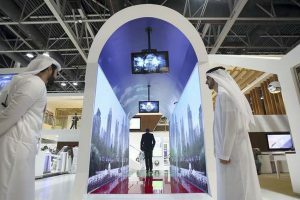 Dubai Airport hopes to skip the tedious process of security clearance counters or e-gates, choosing to replace it with a tunnel equipped with 80 cameras working to verify each passenger’s identity. The images displayed in the tunnel can be changed to show a variety of landscapes or advertisements, and upon arriving at the end of the tunnel, the traveller is met with either the message “Have a nice trip”, or a red sign will be displayed to alert security. “The fish is a sort of entertainment and something new for the traveller but, at the end of the day, it attracts the vision of the travellers to different corners in the tunnel for the cameras to capture his/her face print,” foreign affairs chief Major Gen Obaid Al Hameeri told ‘The National’. The groundbreaking tunnel is set to be up and running in terminal 3 by the end of 2018, and it is expected that the rest of the terminals should be fully functioning by 2020. How exciting!